The sale of endoscopy accessories is part of our service, together with sales and rentals of used endoscopes as well as endoscope repair. If you are unable to find the desired accessory or supply materials for your endoscope, please feel free to call on us. In our online shop we distribute used processors, light sources, and other accessories made by Olympus, Pentax, Fujinon, etc. The MedicalConnect catalog includes primarily small accessories, such as forceps, graspers, cleaning utensils, and valves. In our catalog you will find new endoscopy accessories and consumable materials made by top-quality manufacturers. 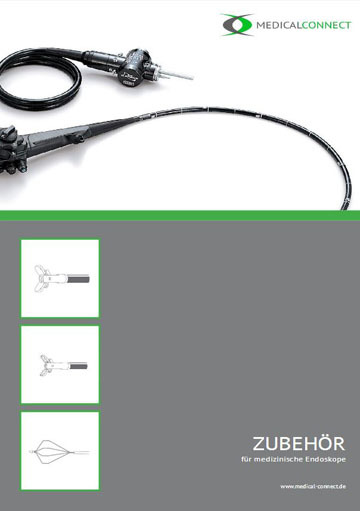 We offer an extensive selection of accessories for medical endoscopes in different sizes and variants. In the online shop you will find used technical accessories for endoscopy. Currently, we carry components such as endoscopy carts or trolleys, ETDs (Endo Thermo Disinfectors) as well as specialized cables and adapters.